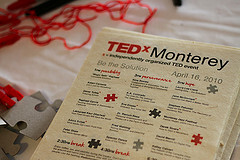 In April, Monterey, California, hosted its first TEDx event. The TEDx program is an offshoot of the yearly Technology Entertainment and Design conference. TEDx events are independently organized by local communities. Notably, TEDxMonterey featured live audio in 8 different languages including Spanish, Russian, Chinese, Japanese, Russian, French, German and Korean. Students from the Monterey Institute of International Studies (MIIS) provided simultaneous interpretation during the conference. I recently had the opportunity to speak with one of the student interpreters, Lu Ye, about the conference. How did you first hear about the TEDxMonterey event and how did you get involved? The MIIS (Monterey Institute of International Studies) organized the conference. They posted information inviting students to volunteer to interpret. Anyone in the school’s Conference Interpretation specialization could participate, and it was first-come, first-serve. There’s an assumption that students at that level are capable of doing the job. Students found out about TEDx two weeks in advance and started preparing one week before the event. At rehearsals, TEDx speakers were invited to give briefings. Some gave their outlines, and some even recited their speeches beforehand. What was the experience like of interpreting at TEDxMonterey? It was great. The whole interpretation was broadcast live via the internet, so we got a lot of traffic. Our booth got over a hundred listeners from around the world. It was different from the classroom setting. The TED speakers spoke faster than what we’re used to in class. They talk without considering that people are interpreting what they say. Do you have any observations about simultaneous interpretation after your experience at TEDx? We have a practicum at MIIS which is organized in combination with other programs like business and international policy studies. Translation and Interpretation students go into booths to interpret for presentations that are organized in the auditorium. We practice without the pressure of making mistakes or shouldering responsibilities – we only have our peers sitting in and giving comments. With TEDxMonterey, this was the first time I broadcast my interpretations around the world. The added pressure actually helped enhance the quality of my interpreting rendition. Personally, I feel that it’s easier for me to build a connection with the speaker this way. During simultaneous interpretation you feel like your spirit flies out of your body and into the speaker. You begin to think like the speaker. You’re basically in that person’s mind, but speaking in a different language. Lu Ye is a professional Chinese-English translator and interpreter based out of the Monterey area. She graduated with a master’s degree in conference interpretation this May. You can reach her at luludt2002 [at] yahoo.com.cn.